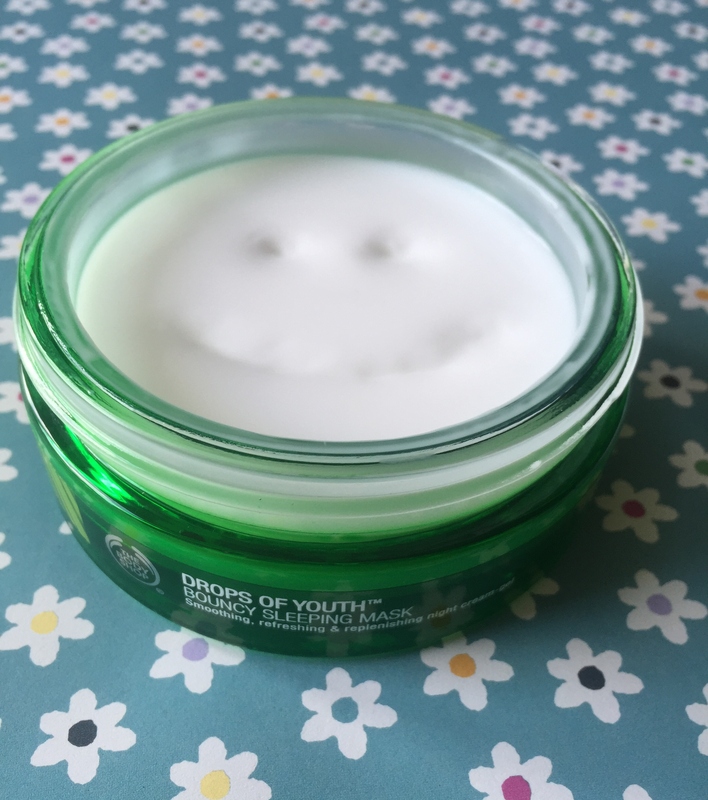 When I first heard about The Body Shop’s new Drops of Youth Bouncy Sleeping Mask, I knew I just HAD to have this. First of all, I was very intrigued as to what it meant by bouncy. 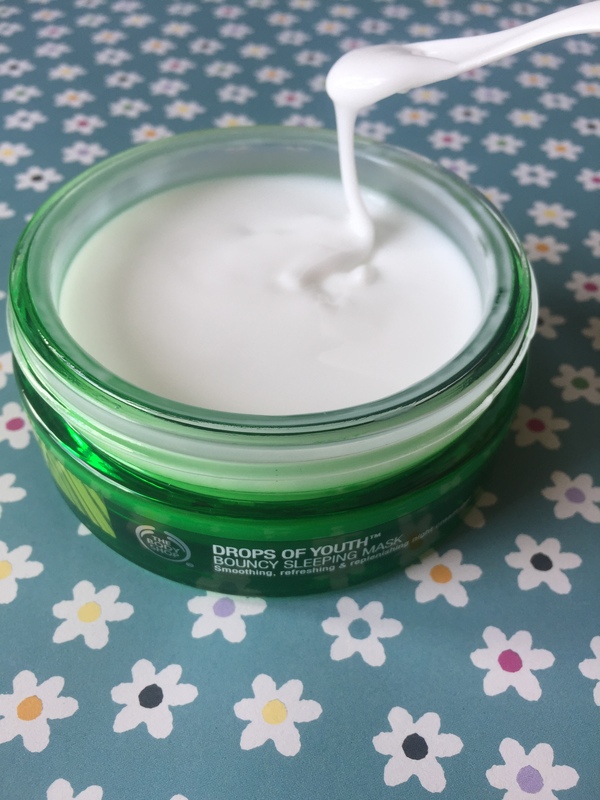 I have trialled out other sleeping masks in the past which seem to leave an odd residue on your skin so I was hopeful that this one would be everything that I was hoping for. Firstly it’s a cream gel formation which is enriched with Edelweiss stem cells. Now I have trialled various creams and various gel formations, but never a combination. Something to note, if you have dry parched skin you should really use a gel rather than a cream based moisturiser. A beauty therapist kindly informed me that a cream will just sit on the skin whereas a gel will soak into the skin providing ultimate hydration. Let me tell you, she was not wrong and since I switched, my make up doesn’t just sit on my skin where I could rub it off, it now looks flawless! The mask is designed to be left on overnight. You can still do your evening skin care routine, it’s just that this is an extra final step to it. As the formulation seems quite thick and jelly like, it comes with a spatula so it’s easy to apply. You really only need to use the smallest amount. It takes a couple of minutes to soak in, if you put too much on it will remain a little bit sticky but you just need to wait a little while before jumping into bed. When applied, it feels extremely cooling and refreshing on your skin. In the morning once you wash it off, your skin looks fresh, smoothed and rejuvenated. After the first use I noticed a difference straight away. My face had a youthful glow, my skin felt super hydrated and my make up was so easy to apply. I absolutely love this product. The fragrance is very fresh and has a hint of cucumber. I could quite happily smell this all day! It doesn’t leave any residue on your skin which is also a plus. The full size is 90ml and is £22. Although this may sound quite pricey, you really only need to use such a small amount and this will last a very long time. I’ve used it about six times already and it doesn’t look like I’ve used anything. Let me know if you have tried this as I’d love to know your thoughts and whether it made a difference. Also, if you have tried any of the other range I’d love to know what you think as I’m thinking about exploring it pretty soon. I absolutely love your reviews ! I have to get my hands on this stuff! ← Sweet Potato with Cinnamon – The Tastiest Snack You Just HAVE to Try! !